Green lines – Fiber to go in trench shared with Bennington city water project. Blue lines – Proposed fiber-to-the-home build out. Orange line- Existing main fiber transport line connecting Bear Lake County to the world. 2015-Proposed Bennington fiber optic cable build by Direct Communications, showing where new fiber lines will be buried, along with neighborhood hand holds, and fiber drops to each home. 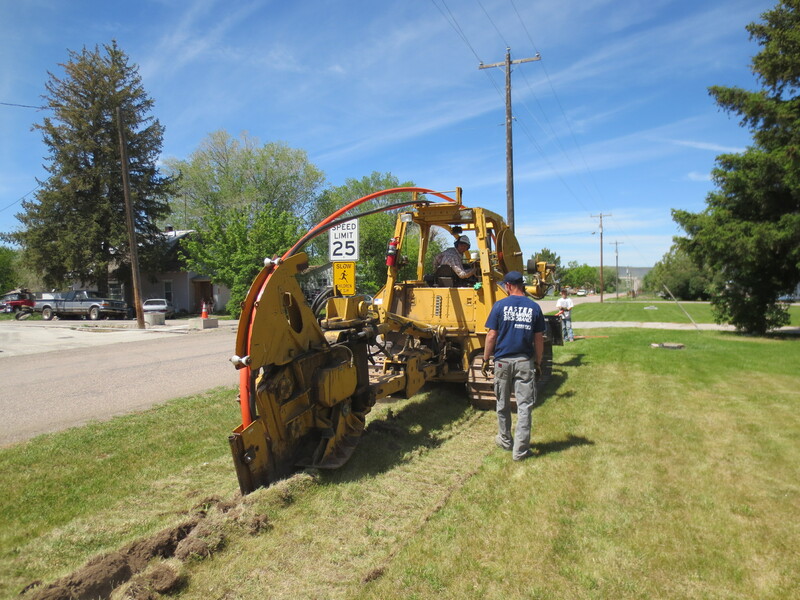 During 2015, rural Idaho Fiber Optic Internet Provider, Direct Communications, hopes to build out a brand new fiber optic cable network in Bennington Idaho, that will bring fiber directly to each home in town that orders fiber optic service. The wait is almost over for fast, reliable, state-of-the art Internet to finally come to Bennington. Direct Communications presented their plan for building out the city of Bennington, Idaho with Fiber-to-the-Home at an open meeting hosted by the city at the Bennington LDS Chapel on Wednesday, April 1. Direct Communications will be partnering with the city to share some of the trenches associated with the Bennington Water Project for a concurrent fiber project. Fiber is the future of communications, and the key to future economic growth, education, entertainment, and access to a world of opportunities in our new information economy. Fiber to your home will improve your life even if you don’t use the Internet, because fiber optic cable to a home will instantly increase the value of your home. Bennington will have the most advanced modern communications network available anywhere in America. Most residents in big cities, even in the most expensive neighborhoods in the USA, do not yet have access to fiber optic cable, but soon you will join the 6% of Americans with access to this fantastic service. During the construction period, we will announce a window for fiber construction drops. You will need to order service during this construction period by calling 208 548 2345. If you do not order Internet Service during the construction window, you may miss your chance to ever get fiber to your home. Pre-register now for fiber to your home. Directcom Fiber will bring residents connection speeds 100 times faster than what is currently available in rural Bennington. Work from home, start an online business, enjoy instant downloads, immediate uploads, and faster streaming HD video like Netflix SuperHD . Fiber is more than just Internet. It’s endless possibilities. Phase 1: Bury main conduit 48” deep in shared water trench and then along the remaining city streets. Phase 3: Plow in individual conduit drops to each home as ordered. (½” plastic conduit into a thin trench, about 18” deep. Phase 4: Blow fiber optic cable through the underground plastic conduit. Phase 5: Splice final fiber cable drop going to each home back into the main cables. Phase 6: Install new fiber electronics at central switch to feed homes. Phase 7: Mount new fiber NID (network interface device) on the outside of each home. Phase 8: Make final connection from your computer or router to your new fiber line via ONT (optic network terminal) This ONT will convert the digital light signals sent over the fiber, into an Ethernet signal which can be read by home computers. Fiber is the future of communications technology. Fiber optic cable contains strands of optically pure glass, thinner than a human hair, which carry digital information over long distances. Digital signals are sent as pulses of light down the glass fibers, without interference or limitation. This digital transport system is faster, clearer, more reliable, and will give you the bandwidth to access the digital communications services of the future, and today’s IP-based broadband apps such as streaming video, VOIP, video conferencing, home security systems, remote appliance management, and residential internet speeds up to 1 Gig speeds, just like Google provides in Provo, Utah. The fastest connection speed known to man. We currently offer an unmatched 1000 Mbps residential speed to our fiber customers. Fiber to the home uses a pure ethernet connection back to your ISP, without needing intermediate equipment like a modem. This results in a much more stable, reliable service, which means no downtime for you. Fiber to the home virtually eliminates most equipment issues, and downtime typically experienced by internet subscribers. Unlimited carrying capacity means NO CAPS. The bandwidth, like speed is only limited by the processing power of the electronics on each end of the fiber. We will never cap your data usage, or throttle your speeds. Stream as much video as you like without ever worrying about overages. Unlike copper, there is no resistance in the fiber optic cable, so the signal can travel much further distances. This means we can now serve even the most remote customers with the same consistent service no matter where where you live. Because it’s literally light being transmitted, there is no interference from electromagnetic noise such as neighbor’s routers, appliances, radios, motors, power lines, or other nearby cables. This means a clearer signal and better broadband connection for you. Even lighting strikes, which can be transmitted by copper cabling, are not transmitted by fiber-optic cable. Fiber optic cables costs less to maintain than traditional copper lines, saving us all time and money.